This has inspired me to photograph my collection of Star Wars figures. I've got a good amount, a ton of POTF2 and some of every line since. besides, the figures are for creating movies with, or for handling them with your hands. They do that so they can resell them later when the price has risen much higher. You can't sell a figure that has already been taken out. Of course, I would never sell my Commander Appo action figure. It's the only figure that I have. I don't have any real display for my figures, I keep most of them in plastic organizers for storage. But I did set them up to take pictures. First, there's my POTF2 figures. I have most of the line, these were always my favorite toys. I only have a few figures from each prequel movie line, this is all. I have quite a few figures from the recent post-movie lines, The Saga Collection, 30th Anniversary Collection, and Legacy Collection. Since there are so many, I split them into original trilogy era and prequel era. Theres more around that I have to dig up. EDITED: I accidentalyposted the same pic a few times in there, but I have now swapped in the right ones. Sorry! it's so cool! The best ever figure I've seen!!!!!!!!!!!!!!!!!!!!!!!!!!!!!!!!!!!! PJ, your POTF collection is very similar to mine. You have a bunch of figures that I got as a kid. And your Saga Collection, 30th Ann., and Legacy collection is amazing. WHERE THE HELL DID YOU GET THAT WHITE DARTH VADER!!! And for that matter that Xizor? I only have the old POTF version. Those Imperial Knights in the back are also awesome. Those are all from the comic packs. I really love the EU comic packs they've been doing. I have quite a few Darth Vaders from over the years, but the white version really called to me. I'm missing quite a few of my old POTF2 figures. I had the rest of the original Shadows of the Empire figures, and the Slave 1, but I have no idea where they are now. That ship was my favorite, and I especially loved the Luke in Coruscant Guard disguise. Hopefully I come across the rest of my figures some day. You must have collected all that about for 18 years! Great great stuff... But yeah the Shadows of the Empire figures were great, I also have the Luke in Coruscant guard disguise figure but i lost his helmet and cape...regrettably. It was a really cool figure. The more I think about it... I might try to Ebay another one of those. I miss that figure. As much as I always loved the 3 3/4" figures, my real favorites years ago were the Micro Machines. I had a lot of those transforming head playsets, the little Hoth, Tatooine, Endor and Dagobah environments, tons of little figures and vehicles... I collected a good amount of the Episode 1 sets, then there were none for Episode 2, only a few Action Fleet type toys, and Episode 3 only had the Titanium die cast ships. I have a few of those, but Hasbro has just announced that they are cancelling that line. the Titanium die cast ships. I have a few of those, but Hasbro has just announced that they are cancelling that line. Cancelling it BEFORE they produced an Outrider diecast model...of course. Just another set back by Hasbro, im so sick of them. They didnt do too well with the Indiana Jones line, and that really disappointed me. Im so... nothing... I only got speeder, Slave 1, Millenium Falcon, Tyderium, Luke in Endor, Han Solo, Anakin (2), Darth Mauls ship, Jango Fett, Han Solo (Hoth) and so on. And I got a Boba Fett Marc Ecko sweater... regular price was 120-130$, but I bought it for half price. That's a pretty good collection. Who? Do you both mean me? No, not a big deal. Darth Mauls ship is like a miniature. And Tyderium is little bigger. Not a big stuff. But... I can show my Boba Fett sweater later. BEHOLD WHAT I HAVE FORSEEN!! He has a cloth cloak and other cool features...HE SHALL BE MINE! I've had that figure for a few months. They are very good with the accessories on that wave. Two figures in it are actually 2-packs (Trinto Duaba w/ Dice Ibegon and Jawa w/ Treadwell droid), Ben and another have tables, with Ben's including a Leia hologram. I just picked mine up today and I'm in love with it. Ben's left hand is in a Jedi Mind trick posture that is awesome. Ben's one of my top 3 star wars characters and now that I have him, i can die in peace...Victory is mine. 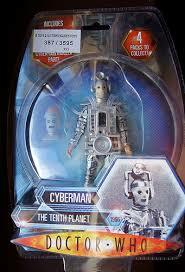 I dont recall saying random things like that first quote when you started talking about that cyberman figure. So dont do it to me. I hope im just misunderstaning one of your many random comments. I know, you're excited. It always is, getting a new fig! 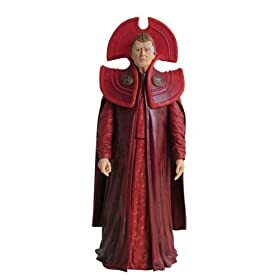 Btw, how is Ben getting along with you're other figures? Has he made any friends? Yes indeed he has, I just dont know whether to put him in a duel pose with one of my Darth Vaders, watching the hologram of Leia asking for his help, or using the mind trick on some one...decisions decisions...the only satisfactory choice would be to buy more! I would make a the death star tunnel walls with the blast door, then maybe ( if you have it ) the millennium falcon, with the hole in the middle of the floor, and some stormtroopers watching. Sorry if that was annoying. Just trying to give some gid tips oot.